On the arrival of the party at Car-Colston, a little before 3 p.m., the main purpose of the excursion was entered upon. This was the unveiling of a memorial tablet to Dr. Thoroton, of which we give an illustration. The brass is a handsome tablet of latten, and has been executed by Messrs. Gawthorp & Sons, of Long Acre, London, and placed in the wall of the south aisle, on a black marble slab, by Messrs. Thrale Brothers, of Newark. Above the inscription the arms of Thoroton impaling those of Boun are emblazoned in metal and enamel, surmounted by a helm with mantling and the crest of Thoroton also duly emblazoned. On a ribbon beneath is the motto—DEVS SCVTVM ET CORNV SALVTIS. 1 Hymn 221 (Ancient and Modern). 2 The Bidding Prayer (all standing). 4 I heard a voice from heaven, etc. (from Burial Service). Almighty God with whom the souls, etc. O merciful God the Father, etc. 6 Hymn 438 (Ancient and Modern). by Mr. T. M. Blagg. 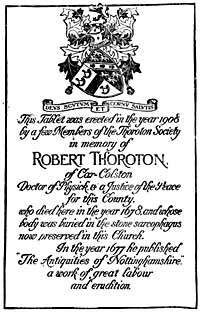 “Robert Thoroton, to honour whose memory we are assembled here to-day, was the eldest child of his parents, and the last of six generations of Roberts in direct male line to reside in this parish. He was born in the year 1623 or 1624, but we do not know where. His parents were married at St. Mary’s Church, in Nottingham, Nov. 30th, 1622, and, as his grandparents were still living in the ancestral home at Car-Colston, it is possible that his parents resided elsewhere during the first years of their married life. At any rate, there is no record of Robert’s baptism in the register of this parish, nor of that of his sister Eliza­beth, though his brothers Richard (1627), Gervase (1630), his sister Mary (1632), and his youngest brother Thomas, in 1636, are all entered as being baptised at Car-Colston. The family of Thoroton derived its name from the neigh­bouring village of Thurverton or Thoroton, where they were seated as landowners as early as the middle of the 13th century. Their property in this parish of Car-Colston was acquired by marriage with the heiress of the family of Morin, who had become possessed of it in like manner by an alliance with the Lovetots, the wealthy family who had founded the Priory of Radford-by-Worksop and endowed it with, among other gifts, the rectory of this Church. Of this descent from one of the great Norman families, Robert Thoroton was always very proud. He refers to it on the tablet which he erected to the memory of his grandfather, in 1664, on the buttress near the chancel door; he quartered the arms of Lovetot and Morin on his shield, and he used the Lovetot lion rampant to uphold the hunting-horn of Thoroton, in the crest with which he surmounted the helm on his achievement. Of Robert Thoroton’s early years we know very little. He took his B.A. degree at Christ’s College, Cam­bridge, in 1642-3, when 19 or 20 years of age; proceeded M.A. in 1646, and became Licentiate of Medicine. He is afterwards described as M.D., though I do not know where he took that degree. That he was properly entitled to it seems undeniable, for he invariably uses it after his name, in his pedigree, on the title page of his book, on his coffin, and on the headstone to his grave. Thoroton married Anne, daughter of Gilbert Bohun or Boun, serjeant-at-law, and impales the arms of that knightly family upon his shield. By Anne Bohun he had three daughters; Anne, who married Philip Sherard, grandson of William, Baron Leitrim in the Peerage of Ireland; Mary, who was drowned in 1655; and Elizabeth, who married John Turner, of Swanwick, in the county of Derby. Thus Robert Thoroton left no descendants in direct male line, and the family is now represented by the descendants of his younger brother Thomas, one of whom resided at Screveton, and married the heiress of the ancient family of Hildyard of Winestead, in Holderness. The family is now seated at Flintham, near here, under the name of Thoroton-Hildyard. After his marriage Thoroton appears to have settled down at Car-Colston for the remainder of his life, busying himself with his practice as a physician, his duties as magistrate, and his hobby of genealogy. His mother died in 1660, and his father probably lived with him, and only pre-deceased him by five years. His ancient house, the manor house of the Morins, so ruinous as far back as 1510, that he records that, on his marriage in that year, his grandfather’s great-grandfather had patched it up “by laying thatch upon the slates where any were left,” had now become so bad that it was past further mending, so in 1666 he pulled it down completely and built another house close by, of the elevation of which a tiny sketch was made by John Throsby, when he visited the village in 1792, and reproduced in his book. This house in its turn became ruinous (as Throsby records) and in 1812 was pulled down. On its site was built the present Hall, the white house occupied by Mr. Wilkinson, which we shall presently pass as we go towards Screveton. In 1768 died Thoroton’s descendant, Margaret More Molyneux, daughter of his grandson, Robert Sherard, and in 1781 trustees sold the property to the Rev. Edward Heathcote, of East Bridgford, for £3,100. For the book itself, though we cannot claim that it is the best county history ever written, we justly believe that it is well in the front rank; and the more one works at such subjects oneself, and the more one has occasion to use the book, the more is one astonished at the vast labour that it re­presents, at the detail it displays, and at the accuracy of the matter it records. Chiefly genealogical in its effect, its pur­pose was to record the descents of all the lands in each parish during the nearly 600 years which had intervened between the Domesday Survey and the compilation of the Doctor’s work. Though 230 years have elapsed since it was published, it is the standard work on our county, and must always remain the chief source of information concerning it. The Doctor did not long survive the completion of his great task. Just as, in our own day, our greatest county writer, Mr. Cornelius Brown, was taken from us as soon as he had finished the greatest of his works, so Thoroton, in his day, was allowed but a short time in which to taste the sweets of labour well done. On November 21st, 1678, he died, and was buried, two days later, in the great stone coffin which six years earlier, realising the uncertainty of this transitory life, he had prepared for the reception of his body. In 1842, the coffin was discovered outside the chancel door, near the buttress-tablet on which Thoroton had recorded, in concise Latin, so terse and complete a history of his family. 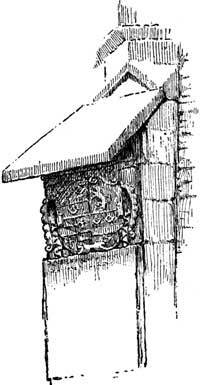 In 1863, being in the way of drainage operations, it was somewhat sacrilegiously taken up, and is now to be seen in the vestry of the church, where its coped lid and wealth of heraldic devices cause it to be an object of much interest. Before leaving the church, many of the visitors made their way to the vestry where they inspected the stone coffin and the parish register containing the entry of Dr. Thoroton’s burial, and the church plate, most of which has been given by the Thoroton family. Mr. Blagg had also placed there some prehistoric and other antiquities found in the parish; and, belonging to his family, two parchment title-deeds bearing the signatures of Robert Thoroton, his wife, father, and other relatives, and of Samuel Brunsell, whose house was to be visited later in the afternoon. There was also a little copy of the lyric poet, Anacreon, with Dr. Thoroton’s autograph on it. On leaving Car Colston, the party proceeded to Screveton Church, where the Rev. J. Standish read the following paper, dealing with the architectural features of the church. He also added some biographical noes on Richard Whalley and others. (1) See the Society’s Transactions, Supplement, for 1901, page 55.